Potassium plays a vital role in kitty's heart health. Hyperkalemia is a medical term for excessive potassium levels. If your cat has this condition, she's probably suffering with kidney problems. 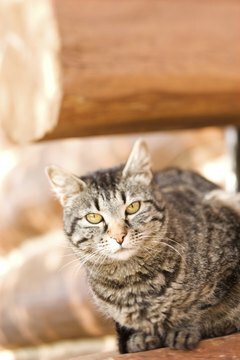 Owners whose kitties have kidney disease need to work closely with a vet to monitor potassium levels as these can also dip to a dangerous low, causing hypokalemia. Potassium is an essential mineral that protects your kitty's muscles and nerves and balances her bodily fluids. Normally, the average, healthy cat diet provides all the potassium your kitty needs, but if she develops certain conditions, such as chronic renal failure or diabetes, then you may need to reassess her potassium consumption in consultation with your vet. It is not advisable to give your cat potassium supplements unless your vet prescribes them, as excessive levels are toxic. High levels of potassium affect the heart. It creates an arrhythmia, or irregular, thready heartbeat. Signs to watch out for are an excessive need to pee, but little fluid coming out. She may also be lethargic and might vomit. Your vet will likely look for an enlarged bladder, a slow, irregular heartbeat and muscle weakness. However, vet Anthony Carr points out in Veterinary Practice News that high levels of potassium don't always significantly affect the heart, so your vet will look for other signs that predispose a cat to hyperkalemia, among them vomiting, raised body temperature and decreased appetite. Cats at the end stage of chronic renal failure are at risk of hyperkalemia because the kidneys are no longer able to eliminate potassium. This can cause heart failure. Earlier on in the stages of CRF, a cat is likely to have depleted levels of potassium, and the vet may prescribe potassium supplements. It's because a cat with CRF is likely to take extra potassium that you need to watch out for the signs that her body can no longer process that excess. Addison's disease, or hypoadrenocorticism, is also associated with hyperkalemia. With this disease the cat's adrenal glands don't function correctly and they fail to produce the hormone cortisol, needed to control potassium blood levels at a normal level. Cortisol also controls salt, sugar and water balance and is the hormonal response to stress. A lack of cortisol doesn't only affect potassium levels, it also makes a pet unable to cope with stress. Cats who are very ill with Addison's need drugs containing cortisol to balance the potassium levels and prevent heart failure. Veterinary Practice News: What's Wrong With Murphy? Feline CRF Information Center. What is CRF?